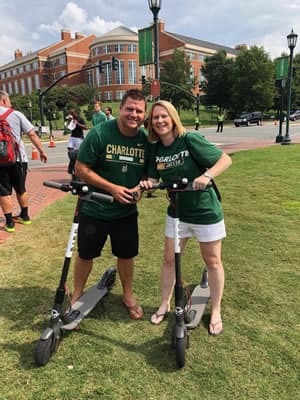 This February, UNC Charlotte is asking alums to share their love stories of how they met their significant others as well as what they love about the University. Stories shared on social media, using #iLOVEUNCC qualify to win exclusive 49er swag, and alums are encouraged to make a gift to support programs, scholarships or departments at LOVE.UNCC.EDU. She was a soccer girl. He was a baseball boy. They met while hanging out with fellow 49ers soccer and baseball team members in the Fretwell Building commons area. But Joseph Vaccaro ’04 didn’t give himself enough credit when it came to luring the love of his life, Kim Miles Vaccaro ’05. He said she was smarter and a better student than he was; she was well-organized and a standout on the soccer field. He, on the other hand, was just trying to figure out life during his time at UNC Charlotte. “Joseph was a go-with-the-flow social guy,” she said, adding that her future husband always was an extremely confident person and never felt the need to justify that. “That’s a really enduring quality that a lot of people don’t have,” she said. So when Joseph Vaccaro contacted Kim Miles via AOL instant messenger while she was studying abroad in Costa Rica and suggested they have dinner at Qdoba upon her return, she agreed. They ended up at TGI Fridays. “I stepped it up on my college budget,” Joseph Vaccaro said. Joseph Vaccaro was chivalrous, something the independent Kim Miles wasn’t used to; for example, he got upset when his future wife wouldn’t let him open doors for her. As their relationship developed, Kim Miles witnessed how grounded Joseph Vaccaro was. He has a sister who is disabled, and he cared for an autistic teenager while in college. Kim Miles said she could tell from those relationships that Joseph Vaccaro would be an amazing father. They were living and dating long distance—he was in Tennessee, and she was in New Jersey—when they decided to spend forever together. The two were talking during her drive home from work when Joseph Vaccaro suddenly said he had to go and hung up the phone. When she arrived at her house, Joseph Vaccaro was down on one knee. Unbeknown to Miles, her roommates had helped to set up the surprise. “I keep her guessing,” Joseph Vaccaro said. They married in July 2009. And Vaccaro said his wife continues to make him a better man. Vaccaro said her husband keeps her laughing and reminds her to have fun. The Vaccaros, who live in the Atlanta area, both work in the transportation logistics field and have two daughters, ages 4 and 7. The baseball field is their special spot on campus; they even had their engagement photos taken there. Kim Vaccaro said the soccer and baseball teams had a special bond. She said the baseball players were a fun crew with whom she shares a lot of good memories. As season tickets holders, they regularly return to Charlotte for football games. And they enthusiastically sport their 49ers gear in Georgia. “We’re huge supporters of (UNC) Charlotte; we believe in it,” Joseph Vaccaro said.